John was born at Coughton Court circa 1524. He was one of the eight sons and of the seventeen children of Sir George Throckmorton of Coughton Court and his wife Kathryn Vaux, daughter of Sir Nicholas, Baron Vaux of Harrowden and his first wife, the widowed Lady Elizabeth Parr [born FitzHugh]. By his mother, he was cousin to Queen Katherine Parr, the sixth queen and wife of King Henry VIII. Household of the Dowager Queen Katherine Parr. Throckmorton isn’t as well known as his elder brothers like Sir Nicholas and Sir Robert. 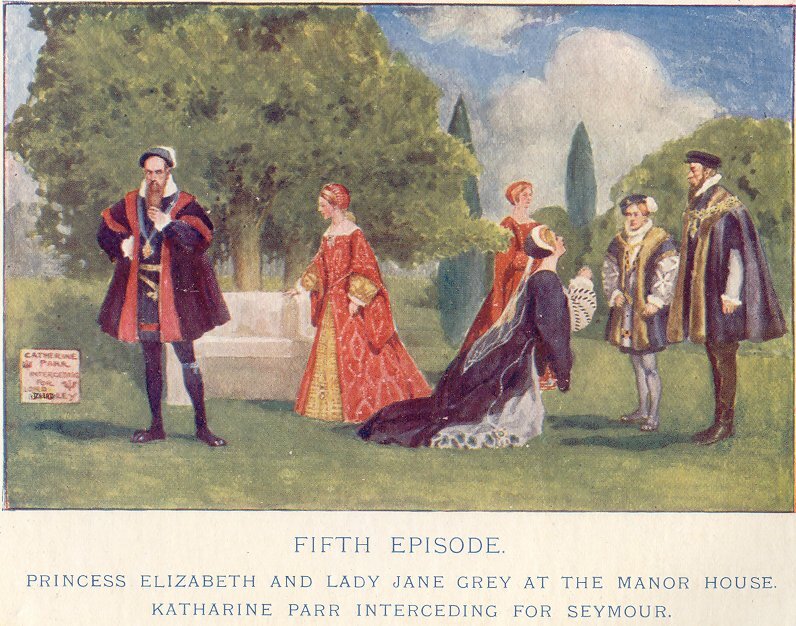 John most likely started his career at court inside the household of Queen Katherine. In the years to come, he definitely had his cousin, Queen Katherine, to thank for his advancement at court. However, when she died in 1548, the advancement wasn’t favored as much and John had to rely on others like the Duke of Northumberland who took over after Edward VI sent his uncle [and Lord Protector] to the scaffold. Among the leading men, Throckmorton had several friends and family links; Queen Katherine’s brother, William, who was now Marquess of Northampton, and the Earl of Pembroke who had married the queen’s sister, Anne. 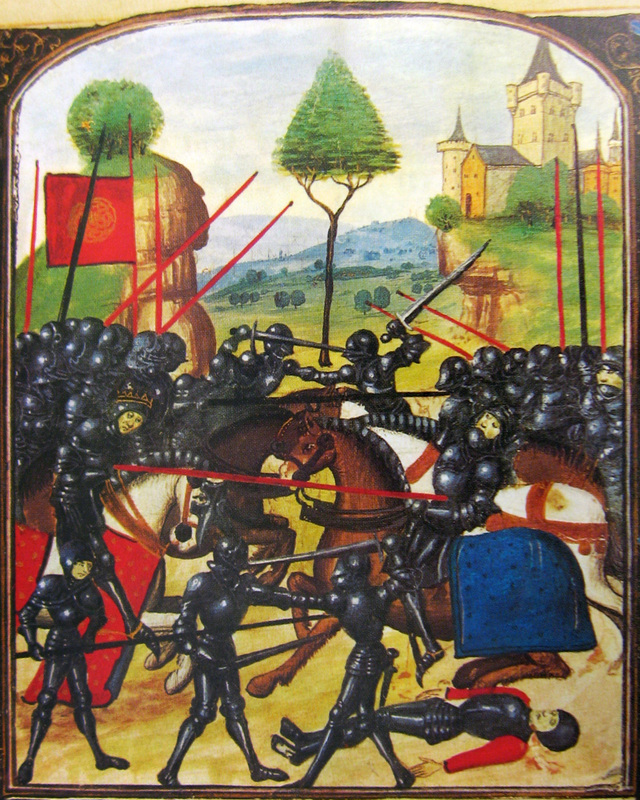 When the little curbuffle with Lady Jane Grey came to pass — loyalties changed. After Sir William Cecil refused to write up the proclamation of Lady Jane becoming queen, the task was given to Throckmorton. Like Cecil, he refused to have anything to do with it. Throckmorton would go on to back the Lady Mary [eldest daughter of King Henry VIII by his first wife, Katherine of Aragon] at Framlingham. Those who remained with Lady Jane [including one of his brothers and the Marquess of Northampton], were met with harsh penalties and punishment for their treason against Mary. His cousin, John [II], was eventually executed under Mary’s command for his role in the Dudley conspriracy. During the five Marian parliaments, Throckmorton would be present for four. His first appearance, with his brother Nicholas, was most likely due to their cousin-in-law, William Herbert, Earl of Pembroke [husband to the late Anne Parr, sister of Queen Catherine and the Marquess of Northampton]. As a Catholic, Throckmorton suffered somewhat under the reign of Mary’s sister, Elizabeth. Four years after his death, his heir would be executed for his role in a revolt against the Protestant queen Elizabeth. Throckmorton married to Margaret Puttenham, daughter of Robert of Sherfield-upon-Loddon. They had at least four sons and two daughters. His son, Francis, would be involved in the great Throckmorton Plot of 1584 which would have replaced Queen Elizabeth with Mary, Queen of Scots [a senior legitimate descendant of the Tudor family by King Henry VIII’s elder sister, Princess Margaret]. Francis is featured in the film Elizabeth: The Golden Age. By both parents, John was cousin to Queen Katherine Parr. However, his mother was the queen’s paternal aunt as her father and Katherine shared the same mother. Parr’s father was the result of his mother’s first marriage to Sir William Parr, Lord of Kendal, while Katherine was the result of their mother’s second marriage to the Lancastrian Sir Nicholas Vaux [later Baron Vaux of Harrowden]. By Katherine Parr’s mother, Maud Green, Katherine was a second cousin, once removed of Sir George Throckmorton as they shared Sir John Throckmorton (born circa 1380) and Eleanor de la Spiney (born circa 1385) as common ancestors. 16 APRIL 1565: The BIRTH of Elizabeth “Bess” Throckmorton, Lady Raleigh (16 April 1565 – 1647) was a lady-in-waiting to Elizabeth I. Bess is said to have been intelligent, forthright, passionate and courageous. Elizabeth Throckmorton would have been a striking person in any age, including our own. She stands alongside Bess of Hardwick, a contemporary, and Lady Anne Clifford, a little later, as an example of the woman who overcomes all the considerable odds stacked against her. Elizabeth’s family had deep rooted connections at court that started centuries before her birth. Elizabeth was the youngest child and only daughter of Sir Nicholas Throckmorton and his wife Anne Carew. Nicholas was the son of Sir George of Coughton Court and Katherine Vaux. The Throckmortons had been at court since the early reign of King Henry IV. Elizabeth’s great-great-grandfather, Sir Thomas Throckmorton, was High Sheriff of Warwick and Leicester counties during Henry’s reign. Nicholas’s mother, Katherine, just happened to be the uterine sister of Sir Thomas Parr, father of the future Queen Katherine. A uterine sibling meant that Sir Thomas and Lady Throckmorton shared the same mother, Elizabeth FitzHugh. Elizabeth was a daughter of Henry, Lord FitzHugh and Lady Alice [born Neville]. As the daughter of a Neville, there is no need to explain the Neville connections to the crown. I will simply note that they were descended from the Beaufort children of Prince John of Gaunt, 1st Duke of Lancaster and his third wife, Katherine Swynford. Elizabeth FitzHugh was at court as Lady Parr until her husband died in 1483. Sir William Parr was a staunch supporter of the House of York and had been a close confidant of King Edward IV. However, once the Duke of Gloucester took the throne as Richard III, Parr declined any involvement in Richard’s coronation and reign. Lord Parr headed north where he died shortly after. His widow, Elizabeth, would marry again sometime before or shortly after Henry Tudor took the throne as King Henry VII. The new husband was a staunch Lancastrian. Nicholas Vaux’s mother had served Margaret of Anjou. Nicholas was a protege of Lady Margaret Beaufort, mother of the new King. And this, my friends, was how it was played at court. Alignment with the right people and monarch on the throne made life comfortable for everyone involved. Elizabeth, now Lady Vaux, had three daughters by her second husband, Nicholas [later Baron Vaux of Harrowden]. Elizabeth Throckmorton’s father, Lord Nicholas, later a diplomat, served in the household of Henry Fitzroy, Duke of Richmond as a page. The position is thought to have been attained by his uncle, Sir William Parr [later Baron Parr of Horton], in 1532. Sir William had been appointed Chamberlain of the household of the illegitimate son of King Henry VIII. Nicholas’s cousin, also named William, was present in Richmond’s household as a companion. William learned and played alongside Richmond and another companion, the Earl of Surrey [Henry Howard]. Nicholas ventured with Fitzroy as he traveled to France to meet King Francis. He stayed on for about a year and became somewhat fluent in French. After Fitzroy’s death in 1536, Nicholas’s options were somewhat limited. His mother, Katherine, used her influence as an aunt to obtain him a position in the household of his cousin, Lord William Parr [created Earl of Essex in December 1543]. In July 1543, his cousin Katherine Parr, was married to King Henry VIII as his sixth queen. By 1544-47 or 8, Nicholas had been appointed to the Queen’s household as a sewer. Nicholas would go on to serve under the rest of the Tudor monarchs; Edward VI, Mary I, and Elizabeth I.
Nicholas Throckmorton and his wife, Anne Carew. Elizabeth’s mother, Anne Carew, was the daughter of Sir Nicholas Carew and Elizabeth Bryan. Lady Bryan married Sir Thomas Bryan and was governess to all three of Henry VIII’s children at one point in time. Lady Bryan was the daughter of Elizabeth Tilney by her first marriage to Sir Humphrey Bourchier. By her mother’s second marriage to Thomas Howard, Earl of Surrey [later Duke of Norfolk], Lady Bryan was an aunt of Queen Anne Boleyn and Queen Katherine Howard. Anne Carew’s father, Nicholas, was a grandson of Eleanor Hoo. Eleanor was sister to Sir Thomas Boleyn’s [father of Queen Anne Boleyn] grandmother, Anne Hoo. Courtiers, by this time, had started to close the gap between the affinity to each other, meaning most of the court was related to each other. One way or another. Elizabeth was only six when her father died. In 1584, she went to court and became a lady-in-waiting to the Queen. She eventually became a gentlewoman of the Privy Chamber (she dressed and undressed Elizabeth). Sir Walter Raleigh was in favour with Queen Elizabeth until he fell in love with the daughter of Sir Nicholas Throckmorton. Look AND Learn History Picture Library. In 1590, she caught the eye of Sir Walter Raleigh, a rising royal favorite. In November 1591, the couple secretly wed after Elizabeth discovered she was pregnant. For months, Elizabeth kept her secret from the queen and withdrew to her brother’s house in London, where she gave birth to a son in March 1592. The queen came to discover what had happened and both Elizabeth and Raleigh were thrown in to The Tower of London. In December 1592, after Elizabeth had lost her child, the two were released, but Raleigh was refused to be seen by the queen for a year and the queen never forgave Lady Raleigh. In 1601, an attempt to restore her at court failed. Lady Raleigh spent most of her time at Sherborne, their country home in Dorset. In 1593, Lady Raleigh gave birth to another son named Walter at Sherborne. Lady Raleigh did come and go between London, but much of the 1590s saw husband and wife separated from each other. Sir Walter Raleigh lead an exhibition to the Orinoco basin to South America in 1595; while in 1596, Raleigh was made a leader of the Cadiz Raid. After the ascension of James I in 1603, Raleigh’s enemies at court convinced King James that he was a threat and Raleigh was imprisoned again in the Tower. In 1605, Lady Raleigh gave birth to another son named Carew either in or around the Tower. In 1609, the King confiscated Sherborne and Lady Raleigh was given a small pension to live off of. Lady Raleigh lived with her husband until 1610. Despite her many appeals, her husband was executed on 29 October 1618. 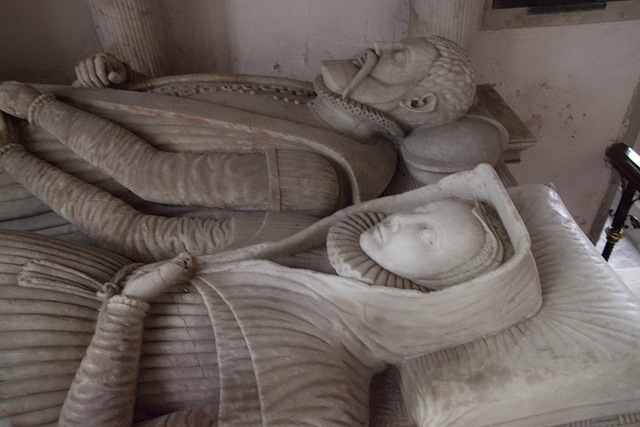 Lady Raleigh ended up keeping her husband’s head which she had embalmed. It is said that she carried the head with her until her own death. Whether that’s true, who knows! Bess would go on to rebuild her life after the death of her husband. She was perused by creditors for the rest of her life but in time came to clear her family’s name. She earned back her fortunes and prospects and ended up a rich widow in time. Bess became good friend to John Donne and Ben Jonson [the play write], and mother of an MP. Elizabeth “Bess” Throckmorton portrayals through out the years in film. The Virgin Queen (1955): Sir Walter Raleigh gains audience with Queen Elizabeth I seeking her support – and money for ships to sail – but soon finds himself caught between the Queen’s desire for him and his love for Beth Throgmorton (Joan Collins). Ben Nye was makeup artist. Elizabeth: The Golden Age (2007): This sequel to Elizabeth deals with Elizabeth’s handling of the Spanish Armada, and the problem of Mary Queen of Scots, while infatuated with sir Walter Raleigh. The Armada is dealt with in short order, Mary with much anguish but thanks to Bess Throckmorton (Abbie Cornish) Raleigh slips from her grasp. Jenny Shircore was hair & makeup designer. “My Just Desire: The Life of Bess Raleigh, Wife to Sir Walter” by Anna Beer. 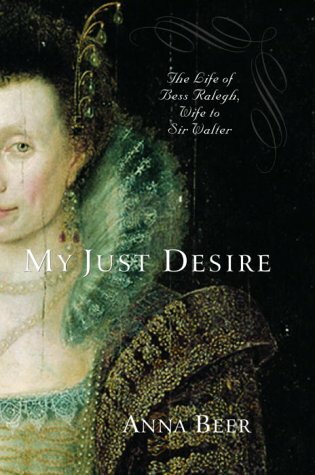 “My Just Desire : The Life of Bess Raleigh, Wife to Sir Walter” by Anne Beer. John A. Wagner, Susan Walters Schmid Ph. D. Encyclopedia of Tudor England, ABC-CLIO, Dec 31, 2011. pg 920-21. Geoffrey Moorhouse. Blessed Bess, The Guardian, Friday 20 February 2004. Laura Eakins. More Fun with Screen Captures, 6 June 2009.